Chocolate and caramel seem to be the best combination made by man, that is why they go along in ice cream, candies, confections and other desserts. 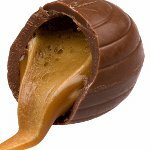 Celebrate National Chocolate Caramel Day on March 19 to honor these two ingredients. Feel free to indulge yourself in your favorite chocolate and caramel candy or add some chocolate and caramel sauces atop pancakes or ice cream. You can do anything on this day, because you have right to celebrate one of the best food combinations. Did you know that the idea of combining caramel and chocolate came up to Milton Hershey? You might be surprised to know, that he began his career at caramel company. Hershey began experimenting with caramel candies to improve them in the late 1800s and found some German-built machines for manufacturing chocolate. Eventually Hershey's attention completely shifted to chocolate, but the very first his product was chocolate-covered caramel candy. These candies became very popular and they are still adored by kids and adults around the world.